Soft ticking noise. This clock is not for the light sleeper who requires complete silence. Wake up to the loud alarm bells of this Double Bell Alarm Clock by Sternreiter. Adorning an exquisite silver/nickel finish, this clock has easy-to-read Arabic numerals and glow in the dark hour markers and hands which makes it convenient to see the time even in the darkest of the nights. Bearing a high quality all-metal mechanism, this mechanical, spring-wound alarm clock can be placed on any tables or bed side and will add to their beauty. The protective glass face ensures durability of this clock. This amazing time piece has been made in Europe and has a soft-ticking noise. 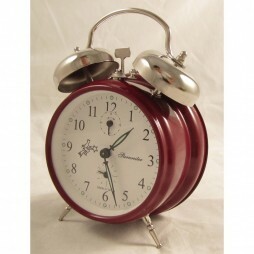 Wake up to the charm of the vintage era with this Sternreiter Double Bell Alarm Clock. Red in color, this clock is designed on the traditional notes. Its loud alarm can bring back even the deepest sleeper out from this slumber. 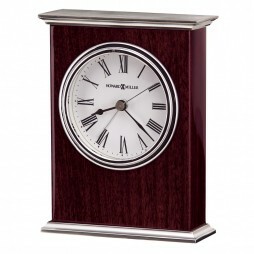 The clock has a soft ticking sound and is crafted from good-quality metal. The white dial of the clock features easy-to-read Arabic numbers that are pointed at by the sleek hands. The markers and hands of this clock glow in dark, giving this a beautiful and functional look! 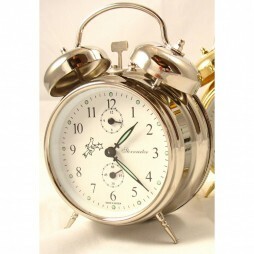 Lay your hands on this exotic, vintage alarm clock by Sternreiter today! 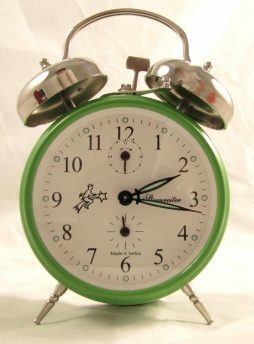 Wake up to the loud and lovely sounds of this beautiful Double Bell Mechanical Alarm Clock ? Green by Sternreiter. 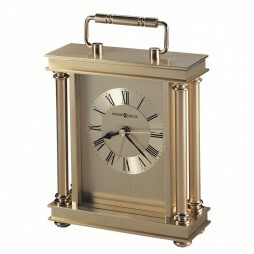 Embellished in a bright green color, this clock features a brass movement. The mechanism of this Serbian made clock features solid brass plates, brass gears, and steel shafts and pivots. This clock has a soft ticking sound that pleasures the ears but is not for the light sleepers or the silence lovers. The dial of this magnificent clock has a white background with easy-to-read Arabic numerals and glow in the dark hour markers and hands along with offset seconds and alarm dials. There is only one way to greet the morning: in style and ready to face the day. With the Howard Miller Mission Table Clock you will certainly be able to do just that. Brought to you in a cobalt blue reptile pattern case, with a nickel finished base and accents, its eclectic tones will give off an electric radiance and magic to its surroundings. 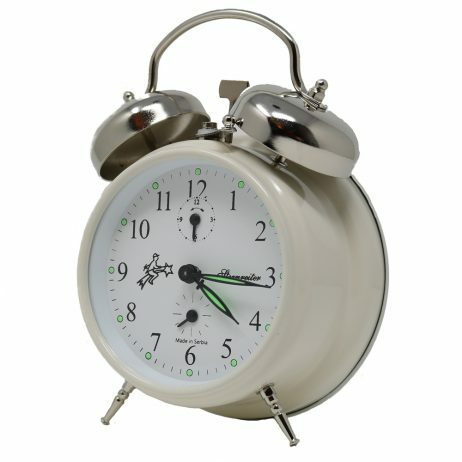 This modern alarm clock also comes with a face covered with a crystal glass lens inscribed with bold Roman numerals and surrounded by a gleaming nickel finished bezel as well as a quartz, battery-operated alarm movement. A nickel finished metal top and base cap the ends of the Kentwood Alarm Clock. The center is constructed of select hardwoods and veneers in a high-gloss Rosewood Hall finish. A silver-tone finished, waterfall bezel surrounds the white dial featuring black numerals and hour and minute hands, with silver second and alarm hands. Beautifully detailed, the Audra Table Alarm Clock adds grace and elegance to any room. 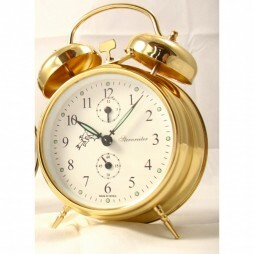 The brushed and polished brass finishes of this metal carriage alarm clock add to its’ refined appeal. The brushed brass-tone dial features a diamond-cut numeral ring, black Roman numerals, black hour and minute hands with brass second and alarm hands under a glass crystal. The stately design is completed by the polished brass-tone corner columns, the decorative handle and turned brass-tone button feet. 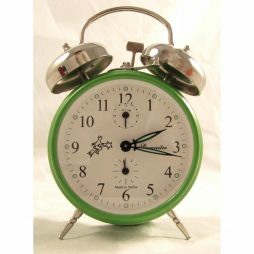 Start your day with the loud sound of the alarm bells of this Double Bell Alarm Clock by Strenreiter. Embellished with a magnificent brass/gold finish, this clock features glow in the dark hour markers and hands, making it comfortable to see the time at night as well. This mechanical, spring-wound alarm clock adorns a high quality all-metal mechanism and its dial features easy-to-read Arabic numerals. 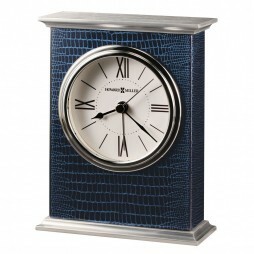 This clock will look beautiful on any table or bed sides. The durability of this Europe made clock is ensured by the protective glass face. The soft-ticking noise is an another amazing feature of this clock.